Our pets always manage to find new ways to surprise us. Although this little guy doesn’t realize it, he let out quite an interesting sound during his nap. Meowing can sometimes be so boring, you take a short Meow, you take a long Meow, you make the “I want to play” Meow, you make the “I want to go to sleep” Meow, Meow here – Meow there, now it is time to try something new. This little fellow fell asleep on his owner’s cozy bed and seems to be having a great nap. 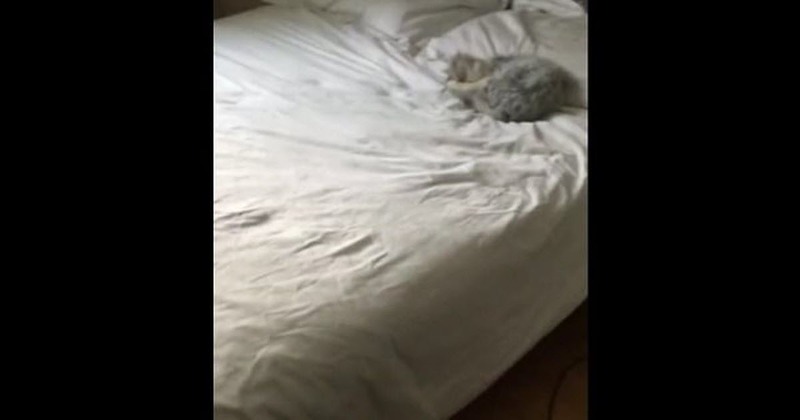 He is so deeply asleep that he doesn’t notice his owner come into the room and start recording the funny sound coming out of his nose. It seems like this cat has a stuffy nose that makes him produce this squeaky sound like someone is playing the trombone. It is so adorable to see and so funny to hear this little guy enjoying his nap. I bet he is chasing mice or dreaming about a nice piece of fish that tastes so good, it had him make a new sound.